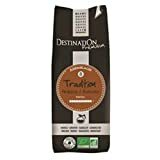 Ideal with breakfast, this coffee comes from a mix of organic South American arabica and African robusta beans. 250g packet. This entry was posted in Organic Health Products and tagged ArabicaRobusta, Coffee, Ground, Organic, Traditional by Organic Health. Bookmark the permalink.